This is a Photoshop tutorial on how to create nice-looking 3D borders for map provinces. The instructions are actually quite simple as long as you keep borders in a separate layer. Make sure all the borders are located in a separate Photoshop layer. The border lines are preferably black and 1px wide. Please note that the Age of Conquest Map Editor can export all the border lines automatically. Otherwise, use either the Photoshop brush or line tool to draw the border lines beforehand. Follow the instructions below and edit the border layer properties to enhance the look of the border lines. 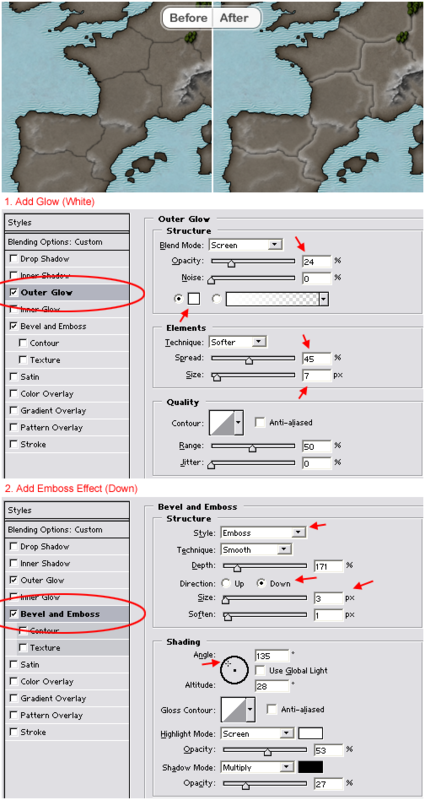 Please note that the guidelines will work as well in other graphics tools such Gimp (free). Thanks for this info and for the template but I am so confused about the relationship between the picture of the that are uploaded and the Map editor tasks that build a map that can be used by AOC. I have created a few initial drafts of maps I think would be enjoyable to play. I was at the point of adding mountains and forests but first wanted to try the AOC map tools. A lot of the functions are simple and I was successful in creating and testing maps but I am not 100% clear on the correct methods to use to create the associations between the image and the AOC requirements. 2. What are borders used for? When you create provinces it looks like province boundaries end up providing all the border data required. 3. Are connections mostly used to link the water locations to provinces? I did use them to do that but I discovered you can also connect provinces and I think points on a border. 4. How do I establish barriers (mountains, forests etc)? 1. draw the provinces in the map editor first and then export the image with just the province borders! You can add the image as a new layer to Photoshop (or gimp) and then apply the effects as shown above. No border tracing necessary. 2. it’s to provide the diplomatic/empire borders. 3. yes, you also link provinces to provinces. 4. just add them manually to the map image that you use as template.